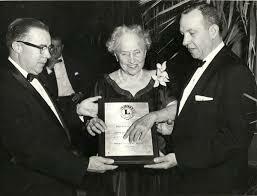 Lions Clubs International began in 1917 as the dream of an enthusiastic Chicago businessman who believed that people should work toward the betterment of their communities. Lions Clubs International is now the world’s largest service club organization with 1.3 million members in 45,000 clubs in 202 countries and geographic areas. Lions are men and women who volunteer their time to humanitarian causes. The association’s motto is “We Serve.” Service to Others Worldwide, Lions clubs are recognized for their service to people who are blind and visually impaired. 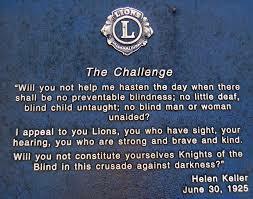 This service began when Helen Keller challenged Lions to become “knights of the blind in the crusade against darkness” during the 1925 Lions Clubs International Convention. Today, Lions extend their commitment to sight conservation through countless local efforts, as well as through their international SightFirst Program, which works to eradicate blindness. Lions also collect and recycle eyeglasses for distribution in developing countries year-round and especially during May, which is Lions Recycle for Sight Month, and October, as a way to mark Lions World Sight Day, which is held the second Thursday of each October. In addition, Lions make a strong commitment to young people through many youth programs. Lions also work to improve the environment, build homes for the disabled, support diabetes education, conduct hearing programs and, through their foundation, provide disaster relief around the world. Click above to visit Lions International.